For All of the latest on-field and off-field club news. The Adelaide University Cricket Club was saddened to learn of the passing earlier this month of Rosemary Penn OAM, after a long illness. Rosemary came to Adelaide from England in 1966 and soon met her future husband Malcolm, the first totally blind law graduate of Adelaide University. Together Rosemary and Malcolm were involved from the early years of the South Australian Blind Cricket Club (now Blind Cricket SA). 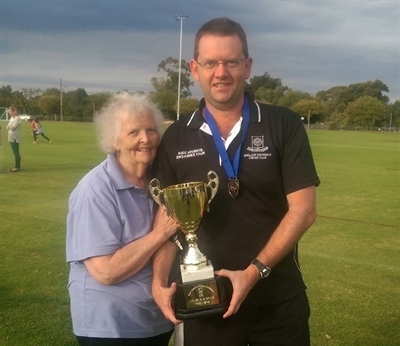 Rosemary held a range of roles including Scorer and State Team Manager. During their time as Secretary and President of BCSA respectively, Rosemary and Malcolm were responsible for the running of three National Blind Cricket championships in Adelaide in the 1970s and 1980s. In 1996, Rosemary and Malcolm were part of the Australian delegation to India to help to establish the international rules for Blind Cricket. 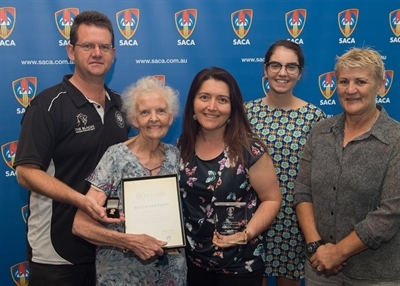 In recognition of her service to the game, Rosemary was made a Life Member of BCSA and a Life Governor of Blind Cricket Australia. In 1999, she was awarded the Order of Australia for “service to visually impaired people, particularly through the South Australian Blind Cricket Club”. 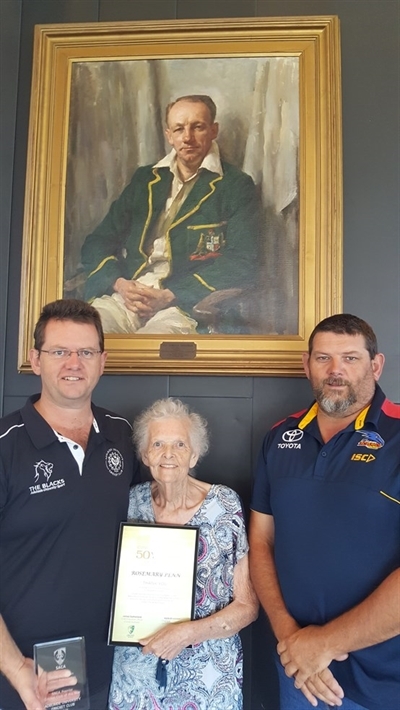 Rosemary Penn OAM, pictured receiving her Cricket Australia 50-year Service Award with son David and AUCC members, Jolene Hall, Bonny Miller and Jo Hedges. She was a keen supporter of the Adelaide University Cricket Club. In the last eight seasons she took a particular interest in AUCC’s Women’s sides, often making it out to watch matches. During that time, Rosemary donated one of the trophies for the Women’s sides, which will continue to be donated in her memory. Rosemary was also a long-standing committee member and Life Member of the Australian Cricket Society (SA). Earlier this year she received a Cricket Australia medal for fifty years’ service to the game. Rosemary pictured with sons David & Philip, both long-term stalwarts of Adelaide Uni CC. To get involved complete an Expression of Interest form and we will get back to you. 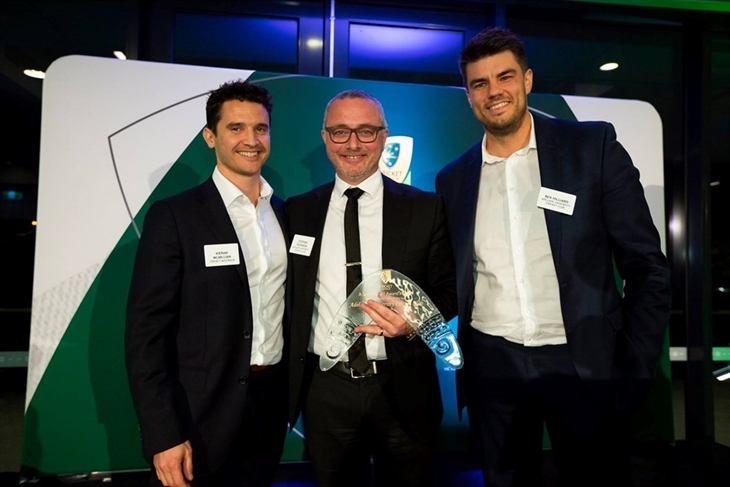 At a star-studded ceremony in Melbourne AUCC won the Award of 2018 Premier Cricket Club of the Year at the Cricket Australia A Sport for All Awards. Club Chairman Stephen Dickinson and Club Head Coach Ben Hilliard were both on hand to collect the award that was presented for our commitment to establishing a strong women’s program focused on learning, improving and retention. The club has a firm focus on inclusion demonstrated by their commitment to introducing international students from non-traditional cricket countries to the game. SACA who nominated us for the award commented, " It's great to see Adelaide Uni getting the gong here – well done! Deserved recognition for the mountains of work you and your team have undertaken over the years". AUCC has created sustainable participation in cricket through the ongoing development of its players and its facilities. The introduction of a women’s development team in the newly established ATCA Women’s competition has now established an internal pathway for female players. 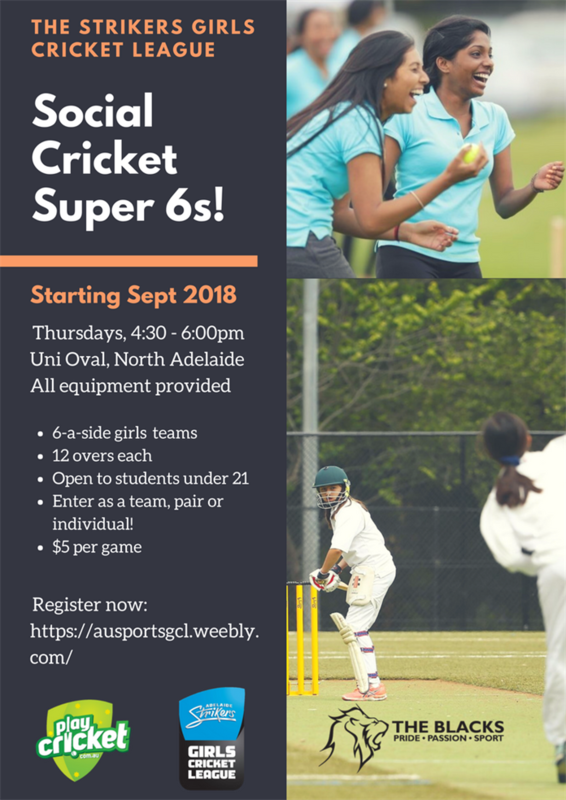 The side has offered more opportunities for beginners to get involved in the game and some of these players have already been selected for matches in the higher SACA side. 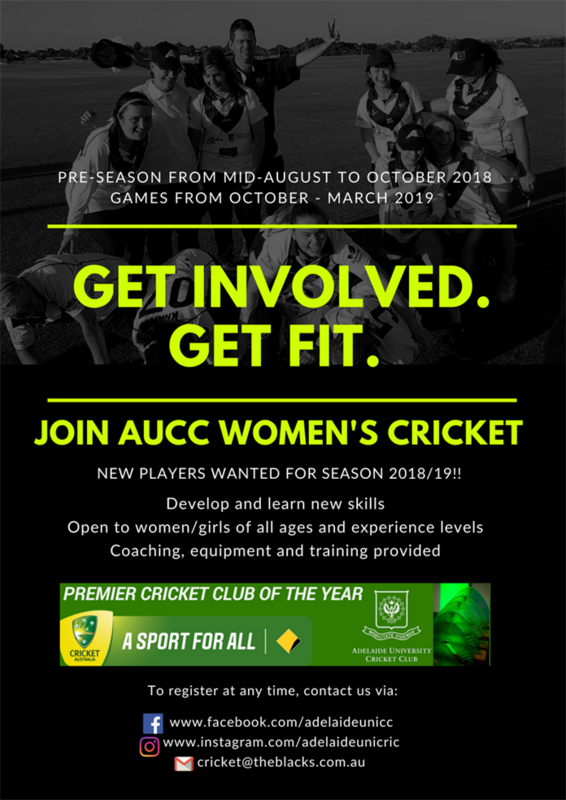 The club encourages its players to undertake coaching accreditation courses so they can provide coaching to other players at AUCC and other clubs. Members of the SACA Women’s side have who have undertaken coaching courses have taken coaching roles within the club. They are also the key drivers behind the club working to establish a Strikers Girls League from within the University community, providing opportunities for girls to learn to play the game. The club also continues to invest in its facilities. This season the hardwicket practice facility at University Oval has been upgraded. This facility is heavily used by the wider community, including school and residential college groups as well as by local residents. University has shown a firm commitment to inclusion especially since re-establishing women’s cricket at the club in 2011. Since that time the club has had players from non-traditional cricket countries such as Germany, Austria and Venezuela. These have been international students who have seen cricket on television and have wanted to ‘have a go’ as part of their experience of living in Australia. This season a current player represented SA in the state aboriginal women’s team at the National Indigenous Championships. In recent years, the men’s senior sides have also experienced a significant change in their demographics. With the increase in numbers of international students, University attracts players from a range of countries including India, Pakistan and Nepal. The club continues to develop its relationship with Blind Cricket SA, playing an annual game against BCSA for the last few years. BCSA regularly train and play at the University Oval grounds. 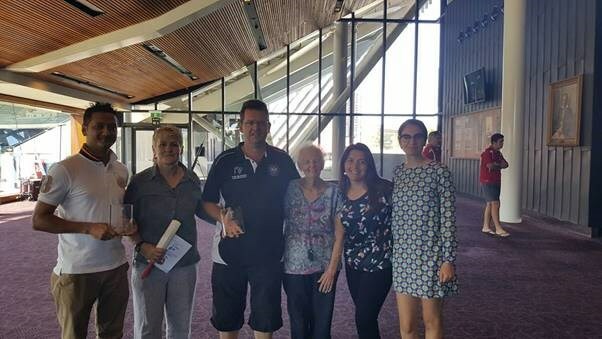 At SACA’s Community Awards, with AUCC members: Deepak Chetry (recognized for his work in the Nepalese community ), Jo Hedges (State Aboriginal Women’s team), Rosemary Penn OAM (Cricket Australia Fifty Year Service award for service to Blind Cricket and AUCC), and Joleen Hall and Bonny Miller (captains of our Women’s teams that have introduced international students from non-traditional cricket countries to the game). The club has ensured a high-quality experience for everyone, regardless of their background in cricket. This season after promoting the Strikers Girls League two high school aged Chinese students have come out to the club to learn to play cricket. They have absolutely loved being a part of the club, regularly attending training and playing a few games in our development side. They have already started to contribute to the club, volunteering at O’Week promotions and helping with the club’s Pink Stumps Day. The Club also has a program of past player lunches and other social events to keep past players engaged with the club. 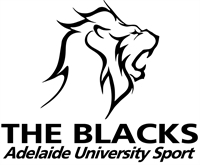 Adelaide Uni has ensured cricket is a sport for all Australians by offering a wide range of opportunities to be involved in the game. This season the club has established an Over 50s side, providing a new chance to play for the club. As a result, the club is now providing the opportunity to be involved in cricket to all Australians; young and old, male and female, and from a wide range of backgrounds. 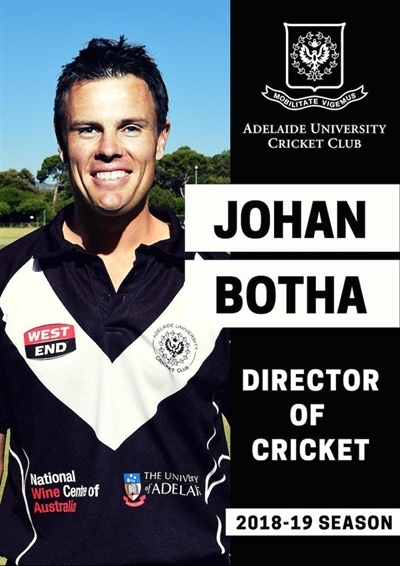 Adelaide University Cricket Club are pleased to announce that we have managed to recruit the services of former Adelaide Strikers and Sydney Sixers all-rounder Johan Botha as Director of Cricket for the upcoming 2018-19 season. A South African international Test, One Day and Twenty20 International Johan brings a huge amount of experience to The Blacks from his time playing professional cricket in the BBL, IPL and in other Twenty20 competitions across the world. This season will see Johan playing for the Hobart Hurricanes in BBL 08 and also coaching Guyana in the Caribbean Premier League. In recent seasons Johan has been playing for Glenelg in the SACA West Premier Cricket but will make the journey over from the bay to take the reins at 'Beautiful' University Oval. Johan will bring a great deal of technical ability and mental strength to the role, with the aim of developing our young squads to win premierships and to play in first class cricket. His role is to work with the coaches throughout the club and to build on the foundations already laid. Johan will also don the whites when he is available, certainly in the early part of the season as he prepares for his Big Bash commitments. Players, coaches and committee members are all excited about the appointment and look forward to working with Johan over the coming season and beyond. I am sure that you will all join us in welcoming Johan to The Blacks and that we can count on your continued support. Cricinfo- " Johan Botha is the quintessential limited-overs player, who does several things well, adding value as a thrifty off spinner, a useful lower-order batsman and a fine fielder. During the late 2000s, he was a regular in South Africa's ODI and T20I squads. Botha's best suit is his offspin bowling: he is accurate, he varies his pace and length intelligently, and isn't afraid to bowl at any stage of an innings - attributes which made him a favourite in the limited-overs format. Between 2007 and 2011, Botha played 66 ODIs and took 64 wickets at an economy rate of 4.53. In the 2011 World Cup, he had a fine economy rate of 4.07 in the five matches he played. Before that, in 2009, he also led South Africa to an ODI series win against Australia in Australia in 2009." Other interests- Johan Botha is an avid runner and attempting "Run down under" (14,000 km in 4 months). He has also taken up playing Baseball in South Australia in the SABL for the West Torrens Baseball Club for the upcoming 2017/2018 Season. See details of how to get involved with our award winning women's team.